Did Bilstein Just Make The Ultimate 4Runner Overland Suspension System? Suspension is often a necessary upgrade for the overlander, who tends to tackle long highway miles to get to the trailhead, and once they’ve arrived at the pavement’s end, need to negotiate technical terrain to reach their destination. The balance of highway driving and trail performance is what causes the seemingly never-ending argument of what comprises the perfect suspension solution. As vehicle-based travelers, we’re often over-equipped for the situation we place ourselves in. On a daily basis, I would suspect far more of us find ourselves cruising down the highway or on gravel backroads at normal speeds than we do ‘crawling’ the Rubicon or ‘pre-running’ the Baja 1000. Yet, suspension systems are often engineered for the situations we are least likely to encounter. Over-engineered, one could say—and often times not engineered in the right places. Heim joints, uniballs, polyurethane bushings, threaded-body coilovers, solid top mounts; components all found in many popular suspension systems. They all can certainly have their place, but I would argue that they don’t belong on most traditional overland vehicles. This is either where you start reading more intently, or cast me off as a cynical traditionalist. 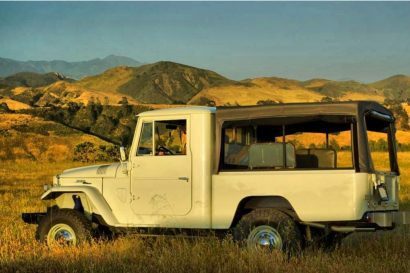 American overlanders often laud unattainable vehicles such as the Land Rover Defender and the Toyota Land Cruiser 70-series for being easy to fix, basic, and reliable while offering a global parts distribution network. 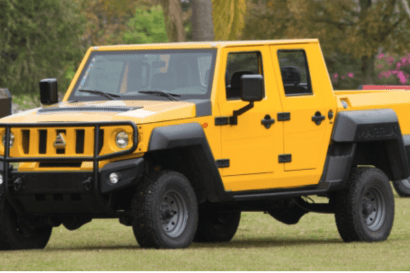 These same individuals also tend to discount domestically available offerings as being too complex—yet they continue to add a plethora of custom modifications to their vehicles, sending them further down the path of which they wish so desperately to avoid. 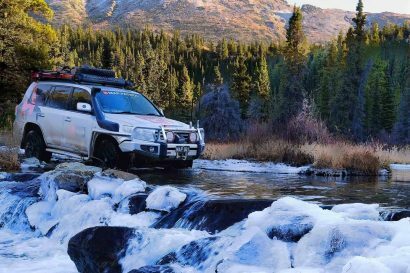 Suspension systems traditionally chosen by overlanders have worked so well because they used OEM suppliers and factory specification to manufacture their products, albeit to a more durable standard. The goal was modest lift heights and an emphasis upon increased load capacity. This was the popular method until the overlander’s equivalent of the LED light bar came onto the scene a few years ago — custom, trick, and expensive suspension systems. In the process, somehow it became acceptable for an overland vehicle to be fitted with a shock that required a rebuild at 12,000 miles, or to fit custom parts that you’d have no chance in hell of acquiring in Timbuktu. It is important to ask the question: Does the vehicle and my style of driving really require such an elaborate and complex solution? Can I service the suspension in the field or in a foreign country? Does the suspension retain factory attachment points? How often does it need to be serviced? Certainly, there are a few high-quality and high-performance suspension systems that do answer yes to the above (like the OME BP-51), but is the expense really necessary? A level stance can be expected with the Bilstein system when paired with Sway-A-Way’s rear springs. 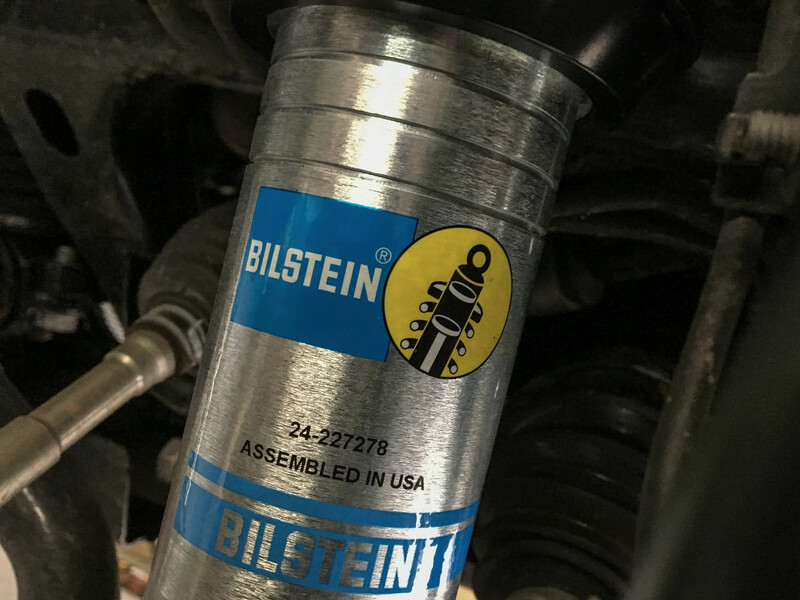 Bilstein has done a great job mixing OEM-engineering with suspension performance to give the overlander nearly everything they need, with long-term reliability to boot. Developed in conjunction with Toyota’s TRD Pro program, the Bilstein 6112, 5160 combination provides significantly increased fluid capacity and dampening performance, without the pitfalls of most other performance suspension systems. It is essentially the same system you can buy from Toyota TRD as a factory part, with the added benefit of adjustable front ride-height perches. Bilstein even uses OEM Toyota-sourced bushings at all contact points, which means factory ride quality is preserved, along with serviceability if you were to blow out a bushing in parts unknown, or simply need to replace it as it wears. This suspension combination is available for modern Tundra, Tacoma, FJ Cruiser and 4Runner platforms. (Left) The front shock is of a larger diameter than factory, nearly 2.5-inches. (Right) Four adjustable spring perches give the benefit of a threaded-body coilover, with lift heights ranging from 1.5 to 2.75 inches. The front 6112 coilover shock absorber integrates a 60mm piston with digressive valving (it’s harder at first, then becomes softer) into a nearly two-and-a-half inch monotube body. The valving helps to control body roll caused by raising the center of gravity. Also included is an Eibach-sourced cold wound spring that’s longer than the factory unit, but uses the same rate. Lift here is attained through the use of the adjustable spring perch and slightly taller coil, not spring rate; too stiff a suspension will result in decreased ride quality and compromised performance. I saw approximately two-inches of lift, and have the ability to go even higher if desired. 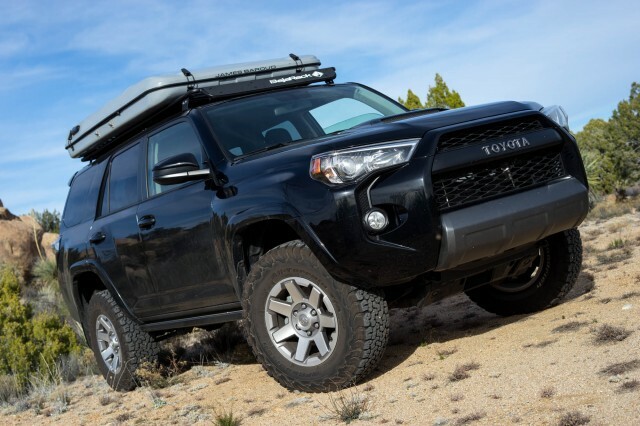 Since I haven’t yet equipped the 4Runner with an aftermarket bumper, I can’t comment on how the spring rate would react to the additional weight, though aftermarket springs will work with the 6112. (Left) A factory-looking remote reservoir mount is included, but only one bolt will work as the frame hole is not threaded. (Right) In addition to the bolt, Sierra Expeditions placed two welds on each side to ensure the mount doesn’t fly off. The 5160 rear shock doesn’t increase oil capacity by way of a larger diameter like the 6112 up front, but it does include a remote reservoir with a factory-style mount. This helps to keep dampening consistent when the shock gets hot, whether this is due to additional weight or driving spiritedly on a rugged road. Unlike the 6112, Bilstein does not include a spring for the back, presumably due to the varying requirements of load carrying that their customers will have. If you’re reading this and you own a 4Runner, the worst thing you can possibly do is fit too heavy of a spring to the rear end — it will destroy the ride comfort of the vehicle and even reduce articulation. I fitted a Sway-A-Way 1.5-inch rear spring built by Eibach which had roughly a 15% increase in spring rate. The combination levels the vehicle, while providing for roughly 150 lbs of additional carrying capacity. I plan to add airbags inside of the coils, as occasionally I’ll use a hitch-hauler for my motorcycles, which results in a significant weight increase. This is a popular modification in Australia on the Prado-specification of this chassis. My only complaint with the 5160 is the included factory-compatible reservoir mount, which didn’t actually mount as promised. 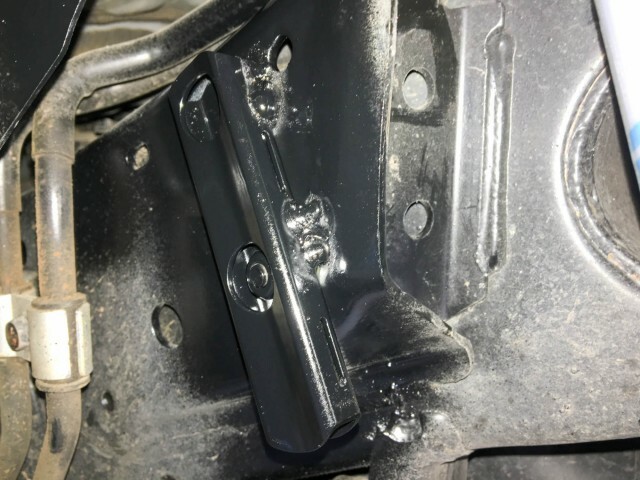 It required welding on the frame to securely attach the bracket, as only one of the two required bolts went into place. This isn’t a big issue if you’re having a professional install the suspension (I had mine installed at Sierra Expeditions) but if you’re a garage mechanic without access to a welder, it could be a hold-up. The quality of construction is what you’d expect from a well-known OEM supplier creating their products in the United States. From my experience, the most-common failure point of an aftermarket shock, assuming it is a quality unit, has always been the bushings—so it’s nice to know they are genuine Toyota units. I was hesitant to lift my 4Runner after spending time behind the wheel of several other built-out 4Runners. They all seemed to severely degrade the on-road ride quality of the vehicle, in addition to adding various clunks and clanks thanks to their race-oriented suspension components. As far as the Bilstein solution goes, I’m incredibly happy with the ride quality. There is no doubt in my mind that for daily use this is the most comfortable system I have tested. 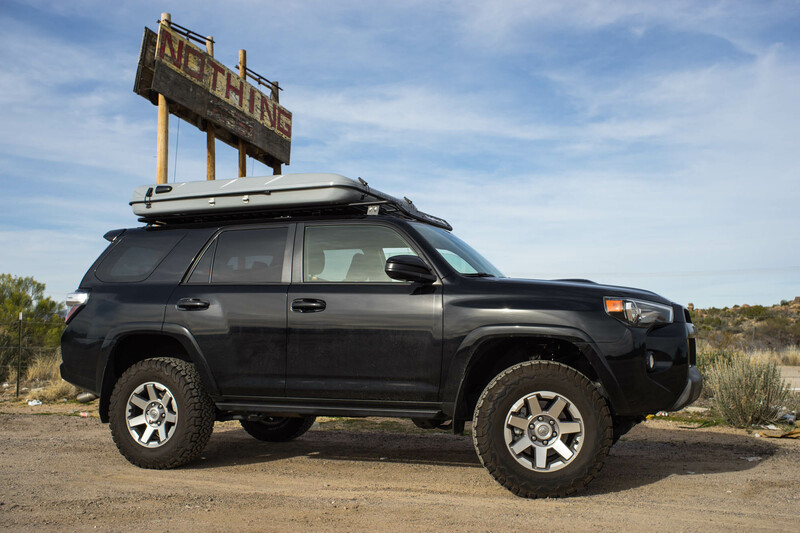 Another 4Runner owner, when playing vehicle swap, described it as riding like a Cadillac compared to his own vehicle, which had a suspension costing roughly the same as a clean, used 80-series Land Cruiser. The Bilstein suspension has minimal jarring and harshness on road, which I found commonplace with other suppliers. There are no strange noises either, something nearly all Toyota suspension systems suffer from when adding aftermarket control arms. That being said, this system could benefit from the addition of a control arm to replace the lost caster caused by the lift — but I’d really hate to loose this smooth, quiet ride. 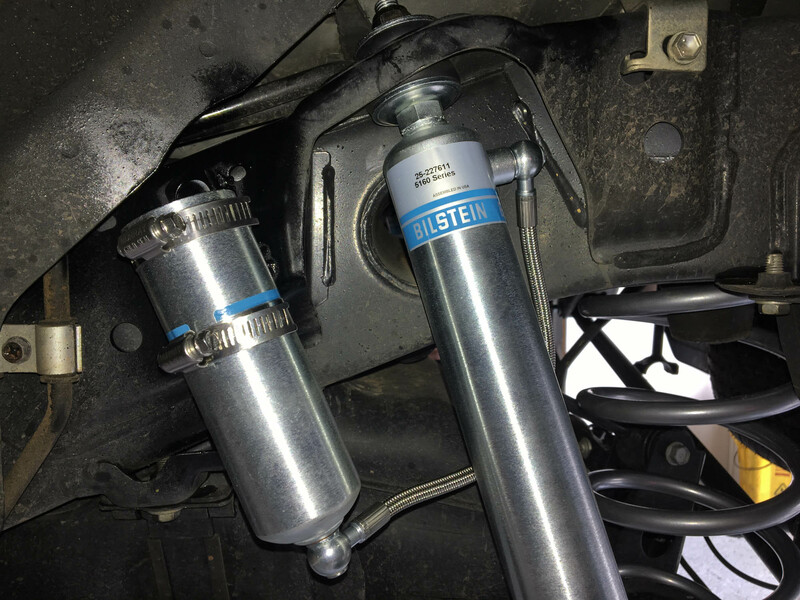 I’m sure some of the suspension systems that Bilstein bests on-road, out-perform it when the going gets rough. You’re not going to get that extra-inch of down travel until you fit control arms, and you aren’t getting the durability added by some kits by-way of beefed-up control arms; though all of this comes at a significantly higher price than Bilstein’s offering. I had traditionally preferred a progressive valving solution, one that progressively becomes firmer as the stroke increases in a somewhat linear fashion. That is until I started putting time behind the wheel of Bilstein’s digressive valving, which starts out quite firm, and only increases dampening moderately as stroke increases. Washboard corrugations are felt slightly more at slow speed, however bumps and ruts at high speed are absorbed quickly, while still effectively attenuating body roll in higher-speed turns. If asked to describe the system in one word, it would be confidence. Washboard corrugations will still disappear provided you made the correct tire choice (I use and strongly believe in BFGoodrich All-Terrain KO2s), and you’re running the correct pressures. No matter how aggressively I drove the vehicle, immediately jumping out after the fastest sections to put a hand on the shocks to judge temperature, they seemed to effectively dissipate the heat — even with a full load. The front end effortlessly—and independently absorbs impacts, and it’s well paired with the solid rear axle. I’d credit this partly to the choice of Sway-A-Way’s rear spring rate balancing the system out. 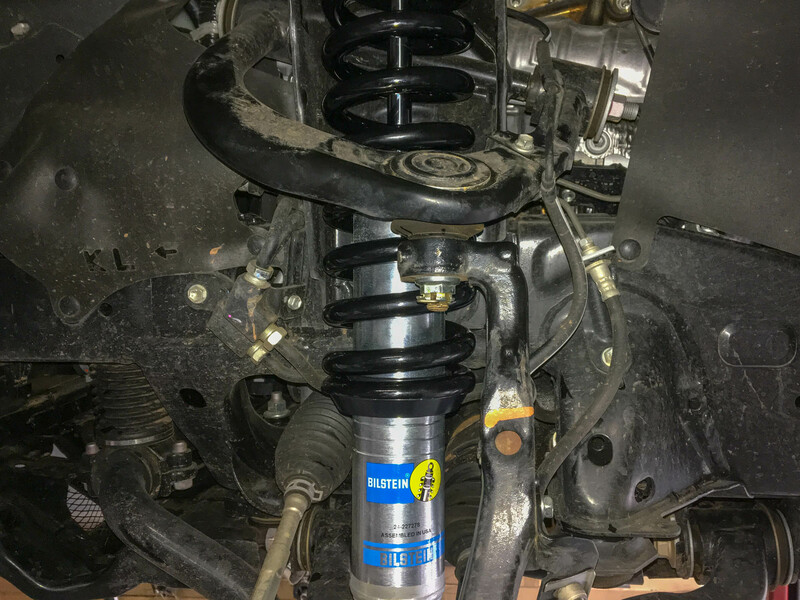 If you’re looking for an OE-quality performance suspension system that won’t ride like a horse-and-buggy on the road, the Bilstein 6112/5160 combo presents an appropriate alternative to the typical yellow-and-black suspension choice of most overlanders. After a 5,000 mile initial test period, with the vehicle covering plenty of highway, technical trails, and forest service roads, I am impressed. This is a system that introduces minimal complexity to the vehicle, and uses OEM bushings and factory engineering to ensure the the 4Runner’s legendary reliability is preserved; keeping in line with the age-old overland mantra of being able to be fixed in Timbuktu.